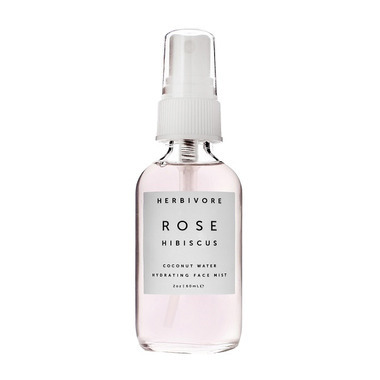 Herbivore Botanicals Rose Hibiscus Face Mist has a coconut water base and is infused with youth-boosting hibiscus extract and moisture-enhancing rose water to tone, hydrate, and soften all skin types. Coconut Water - Excellent for instantly rehydrating the skin and providing a new glow. Hibiscus Flower - Naturally rich in malic and citric acid to provide natural exfoliation and speed up cell turnover, resulting in a youthful and even skin-tone. Also helps skin to lock-in moisture. Rose Water - Hydrating, high in antioxidants, and excellent for reducing redness and inflammation. Directions: Shake before using. Spritz your face a few times for refreshing results. We recommend using it on your face after cleansing and before applying a moisturizer. Do not spray directly in eyes. So far I like this product. The spray mist is refreshing and smells good. I was using it in the morning as part of my skin care regimen but my skin was too dewey for when I put my makeup on so I am now using it mid day for a skin refresh pick me up and it's great! This is a beautiful spray. I got it in the Hydrate and Glow set and just adore it. Scent is gorgeous! I love this product, I'm instantly relaxed too! I use this as a little spritz of moisture during the day. I love that the mist is vegan and natural. But it leaves weird dark rose marks on my skin where I spray it. I don't react like that to the products (and I've used many over the years). The marks go away in 15-20 mins, but I won't buy the mist again. It gives you a natural makeup look by misting your face after putting makeup on! Your face with makeup stays moisturized. I love this spray, leaves my face feeling fresh and smells wonderful! I love the smell of this product. It leaves my face looking fresh and glowing. I keep a bottle at my desk at work for a quick pick me up spray several times a day. . Not sure if it contains enough Hibiscus (the hot new skin care ingredient) to take advantage of its firming properties, but it smells great. I haven't used a face mist before or a toner. This works as a great two in one. You can spray to refresh, or you can spray and use as a toner under other skincare products. I bought this to use under rose hip oil from The Ordinary (also bought from Well.ca) because oil based products should be used over water-based ones like this face mist. I also love the clean ingredients and that the bottle is glass (that means less BPA in my life!) The packaging is also very pretty and simple. I have this on display in my room. This is a lovely facial mist! Great Product! Excellent facial mist. Hydrating and soothing. Helps to tone down the redness I get in my cheeks due to winter weather/dryness. I ordered the smaller size to try for the first time but will definitely re-order the large size version when this one runs out. Best part is that this all-natural product is cruelty-free and vegan! Love this mist. So refreshing and thenscent is lovely. I always check ingredients and this item is a winner for me.